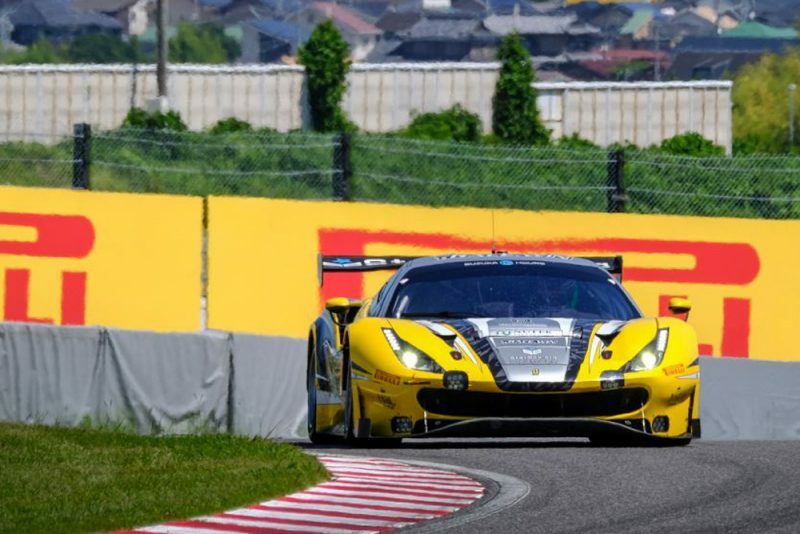 Australian Nick Foster has secured pole position for Sunday’s Suzuka 10 Hours and Round 3 of the Intercontinental GT Challenge in the HubAuto Corsa Ferrari. Foster, who shares the Pro-Am class #28 HubAuto Corsa Ferrari 488 GT3 with David Perel and Japanese driver Hiroki Yoshida, produced a 2:01.740s lap early on in the 15-minute qualifying shootout session to take him to the top, however, not without challenge. Rafaelle Marciello set a late flying lap in the #888 GruppeM Mercedes-AMG GT3 and looked like he would deny the Taiwanese squad and Foster pole, but it proved only second fastest at 2:02.037s. Marciello and co-drivers Maro Engel and Tristan Vautier will start the race as the best placed of the IGTC entrants. HubAuto Corsa’s sister #27 Ferrari qualified third after being bumped from the front row by Marciello’s lap. A late red flag meant no improvements could be made across the board when the #34 Honda NSX GT3 beached itself in the gravel following a spin for Takashi Kogure with just under two minutes remaining. As a result, the session did not restart, granting HubAuto Corsa pole position. The #75 SunEnergy1 Racing Mercedes-AMG GT3 of Australian ex-pat Kenny Habul, Mikael Grenier and Luca Stolz qualified fourth thanks to a 2:02.300s from the latter. KMCG’s #23 Nissan GT-R NISMO GT3 completed the top five courtesy of Oliver Jarvis, ahead of Manthey-Racing’s #911 Porsche 911 GT3-R; the highest placed full-season IGTC entry. Bentley Team M-Sport were seventh in the form of the #07 Continental GT3 of Jules Gounon. New Zealander Earl Bamber qualified the #7 D’station Racing Porsche in 18th outright, while countryman Jono Lester’s #77 sister car finished up outside the top 20. The shootout had been delayed for more than an hour due to discrepancies in track limits infringements in the preceding three group qualifying sessions. Originally scripted to feature 20 cars, the shootout ended up with 24 runners after four more cars were added into the session after multiple errors were found in a number of track limits penalties. The Suzuka 10 Hours gets underway at 1100 AEST.